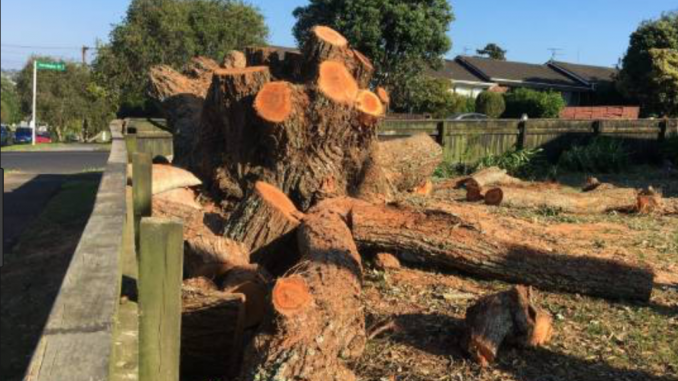 A report into Waitematā Local Board tree loss between 2006-2016 has found that a minimum of 12,879 trees, or 61.23ha of tree canopy, were lost. The number of trees is likely to be higher because larger clearances involve multiple trees. Tree losses were spread throughout the area but were concentrated on private land – an expected finding as Waitematā is dominated by private ownership. Most clearances were small – 57 percent of the loss was caused by the combined impact of many thousands of clearances under 100 square metres. Grey Lynn, Ponsonby and Westmere areas lost the most, and Herne Bay the least. More than three-quarters of all cleared trees had no protection, and more than half of the clearances occurred for no obvious reason. About a third of the removals were because of developments, improvements, and extensions. In 2014 it became clear there was a lack of data about the loss of tree canopy in Waitematā and the Auckland metropolitan area. This report helps to better understand the status and trends of that loss, identify pressures, and assess the effectiveness of plans prepared under the Resource Management Act 1991. The study found newly established canopy and canopy growth in existing trees also occurred, in some cases extensively, but that growth was usually represented by small gains across many tens of thousands of individual trees. For the purposes of the study, a tree was counted as any vegetation three metres or more tall, so that the loss of canopy includes hedges and other vegetation that would probably be regarded by many as shrubs. However, the height used is the threshold for some protection rules. Each clearance was recorded with its years of presence, absence, change, the reason for removal, land ownership and protection. 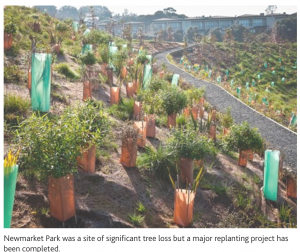 The study also found a relatively small number of clearances in public parks, except at Auckland Zoo’s re-development, and at Victoria Park because of the tunnel project, and where many new trees have now been planted. The authors found no evidence of an increased rate of canopy loss across the 10-year period. They did, however, describe the pattern as ‘death by a thousand cuts’ because more than 90 percent of clearances were very small, yet they accounted for almost two-thirds of the loss. 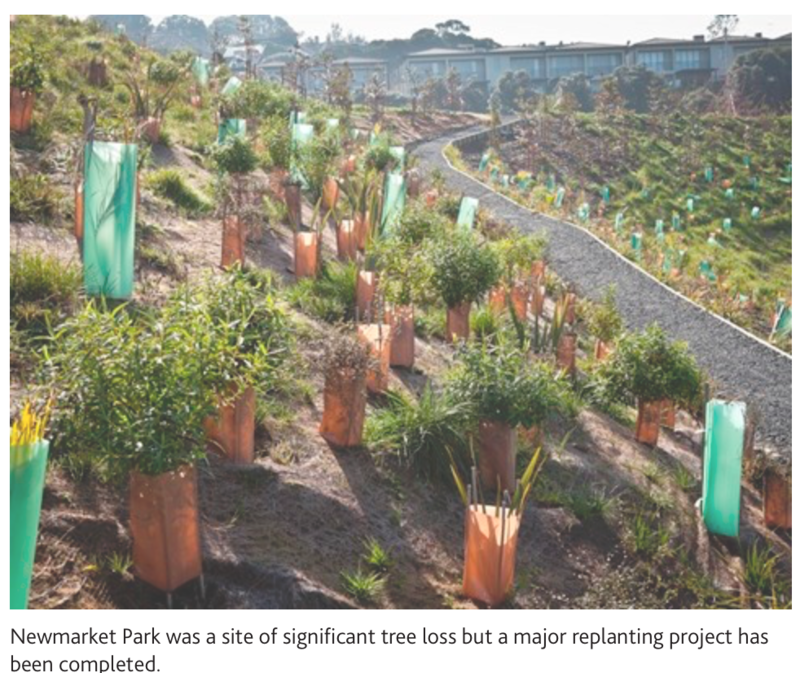 While the council was a significant player in the removal of trees in the ‘high protection’ categories at 86 percent, the absolute amount of clearance was 3.7ha or 6.4 percent of total canopy loss, more than half of it in the Newmarket Park re-development, now extensively replanted. The authors did not know why Herne Bay had less loss than other suburbs but said that, if there was a reason, the area’s lessons could be applied to tree canopy protection across Auckland. “Trees are the lungs of our planet and liveable communities need trees more than ever. During this time of tree loss, there has also been substantial re-planting. Waitematā Local Board has advocated for maintaining our trees in public places and encouraging community planting – and we’ll be continuing to do so,” says Ms. Roche.